Hero Motors is a former moped and scooter manufacturer based in Delhi, India. It is a part of multinational company Hero Group, which also currently owns Hero Motocorp (formerly Hero Honda) and Hero Cycles, among others. Hero Motors was started in the 1960s to manufacture 50 cc two-stroke mopeds but gradually diversified into making larger mopeds, mokicks and scooters in the 1980s and the 1990s. Noteworthy collaborators and technical partners were Puch of Austria and Malaguti of Italy. 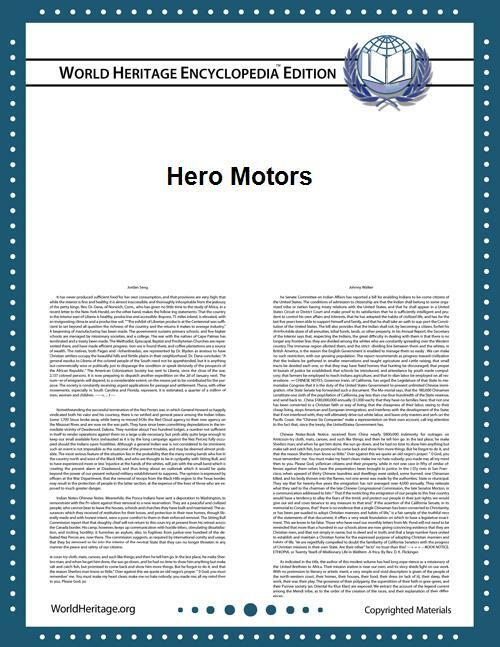 Due to tightening emission regulations and poor sales, Hero motors have discontinued the manufacture of all gasoline powered vehicles and transformed itself into an electric two-wheeler and auto parts manufacturer.